QUESTION: You have previously said that the Persian monetary system was based on gold, the Greeks used silver and the Romans began with bronze. 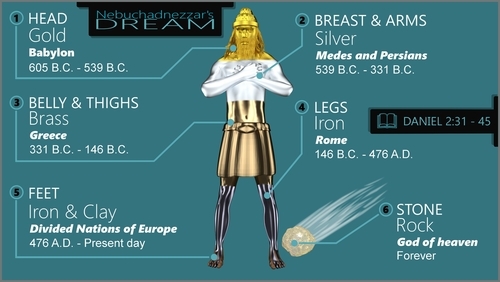 That actually described the Biblical story of the dream of Nebuchadnezzar’s Statue interpreted by Daniel. Do you think your research into the world Monetary System confirms that interpretation? ANSWER: I have been asked that question before. Perhaps I have never answered it on this blog. The history of the world monetary system does appear to provide an accurate interpretation of that dream. However, I have my differences. The Persians had plenty of gold from Anatolia. The foundation of their monetary system began with gold. The first coins were actually issued by the Greeks who occupied Anatolia, (Turkey) which was conquered by the Persians who adopted their monetary system. The first coins were gold electrum, a natural alloy of gold and silver mixed. They eventually refined the electrum into gold and silver coins. That was the birth of the bimetal monetary system. Mainland Greeks possessed silver mines. Athens was famous for its Athenian Owls. 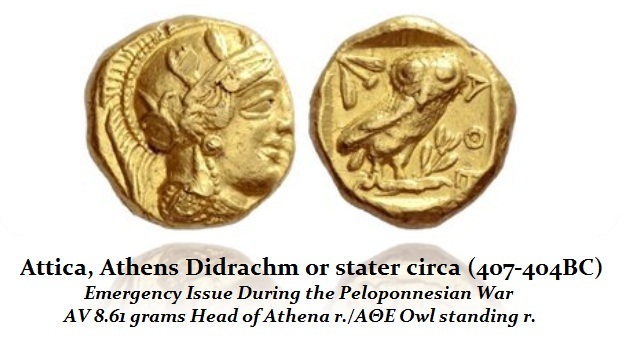 The only time we see Owls struck in gold was as an emergency issue during the Peloponnesian War. This is when we see the first debasement of the silver coinage. It was against this backdrop of war in a desperate fight for survival an emergency coinage was issued in gold. Gold was scarce in the Greek world which relied upon silver. Athens in the last decade of the fifth century was surrounded by the Spartans who cut off their supply of silver by denying them access to their silver mines. Athens was brought to its knees in the midst of military defeat. At first, Athens survived the by tapping into a reserve treasury of some 1,000 talents of silver. This enabled them to produce about 1.5 million silver tetradrachms. Then by 407BC or 406BC, Athens was no longer able to issue silver coinage. This was when they were forced to coin silver plated tetradrachms. Aristophanes’ Frogs (718-33) indicate that the gold coins were struck in 407/406BC, and that silver-plated coins were struck in the year as well. The coinage confirms Aristophanes’ account. Some have argued that the Spartan forged the Athenian Owls to undermine their currency as a war tactic. As for the rare gold coinage of Athens, the Athenians turned to the offerings stored on the Acropolis and the gold-covered statues of Nike. Perhaps this is when one of the Seven Wonder of the ancient world was stripped of her gold – Athena Parthenos. Most people have no clue that the famous Parthenon means ‘house of Parthenos’ meaning the house of Athena the Virgin. The Statute is said to have been taken during the 5th century AD. Some claim it was removed to Constantinople. Athens had possessed an immense treasury, but it was completely depleted to defend in the war. These emergency funds were used to build and outfit a new fleet that in 405BC was defeated at Aegospotami in the Hellespont by the Spartan general Lysander. The Athenian gold from the war is uncommonly well documented for an ancient coinage. The bullion was stripped from seven of the eight golden Nikai on the Acropolis. Each statue was covered in about two talents worth of gold in the form of removable plates which perhaps could have produced 100,000 drachms weight in gold or 50,000 of the coin pictured here – Didrachm. What happened to this production is not known. Very few of these coins have survived and are worth up to $500,000 each. Perhaps the Spartans just melted down everything they could find. 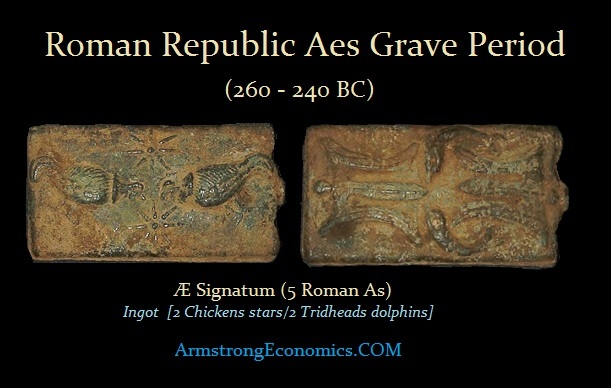 The Monetary System of Rome began with bronze which traded at first in clumps known as Aes Rude and then took form in ingots and round coins all cast at first rather than struck from dies. The “brass” is Orichalcum which was a rare natural alloy. It was first introduced by Augustus (27BC-14AD). 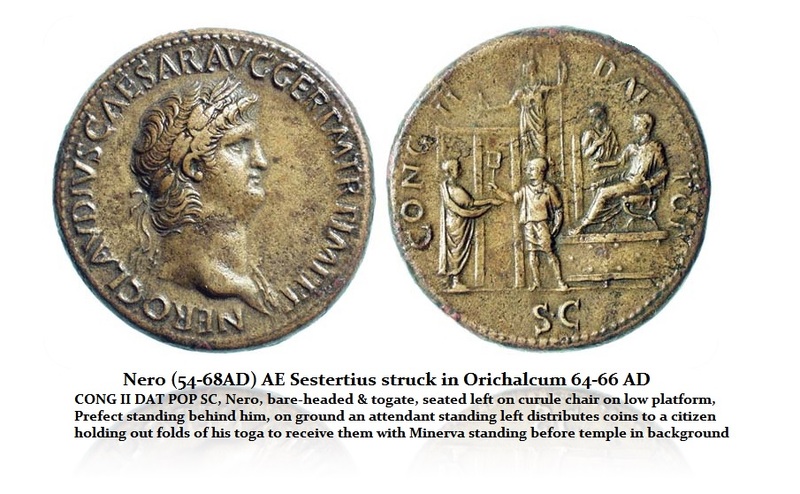 Nero (54-68AD) made use of Orichalcum to give higher value to certain denominations as the Sestertius and Dupondius. If we are to address the legs of Iron, sorry that does not fit the monetary description of the Roman Empire. 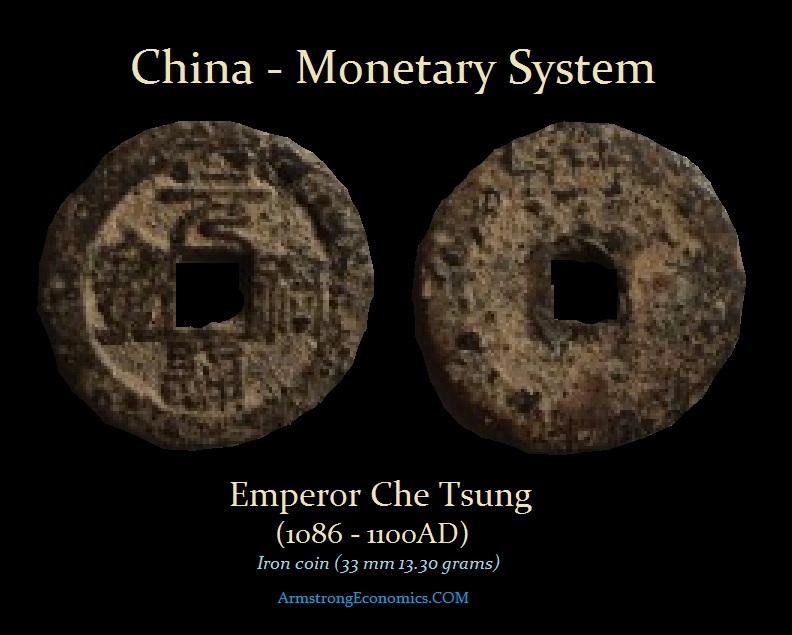 The only monetary system to use iron for coinage was China – not European. Here is an Iron coin made during the period of Emperor Che Tsung (1086 – 1100AD)(33 mm 13.30 grams). After the fall of Rome/Constantinople, the Financial Capital of the World migrated to Asia. So I fail to see where the legs of Iron can be fairly interpreted to be a European Empire. As far as part clay and part Iron, there is such a use of clay in the production of paper. It was known as China Clay Paper. Even the United States used it in the production of postage stamps for a brief period. It tended to have a bluish cast or tint to the paper. 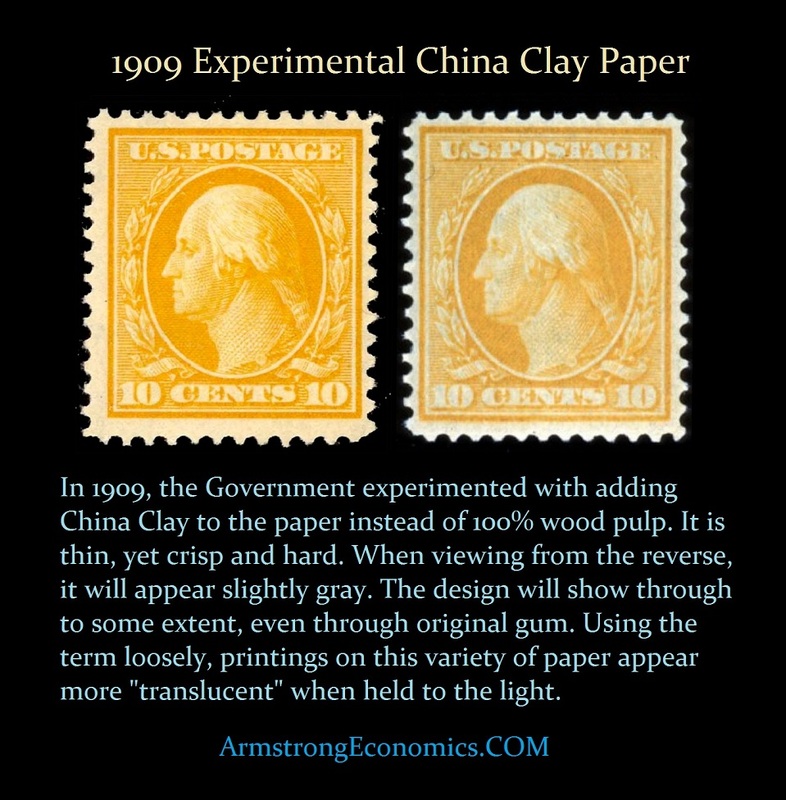 In 1909, the United States briefly experimented with printing stamps on paper with 20% China Clay added to the otherwise 100% wood pulp used to make paper. The paper had a faint grayish tone, and the stamps printed on it are known as “China Clay” stamps. While many know that paper money was invented in China, what they usually do not know is that paper itself was invented in China. Ever since the invention of writing, people had been trying to come up with something easier to write on than clay tablets, sheep skins (parchment), or papyrus. However, it actually took a very long time – some 3000 years to put that notch in the timeline of human society. Paper was invented around 100 BC in China. In 105 AD, under the Han Dynasty emperor Ho-Ti, a government official in China named Ts’ai Lun, was the first to start a paper-making industry. He made paper by mixing finely chopped mulberry bark and hemp rags with water. He then mashed it pounding it flat. After pressing out the water and letting it dry in the sun, he discovered paper. To be fair, for centuries before people used the mulberry bark to make cloth. Consequently, Ts’ai Lun’s paper was a derivative of that process and turned out to be a huge success. With paper available, Buddhist monks in China began to work on ways of mass-producing prayers. By 650 AD they were block-printing prayers. 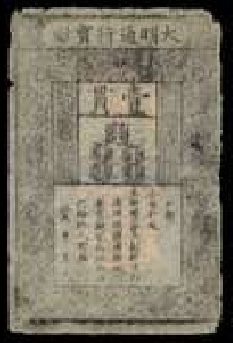 Tang Dynasty (618-907AD) marks the birth of paper money. Consequently, I believe that the prevailing interpretation of Nebuchadnezzar’s Dream seems to be biased toward Western culture. There is no known use of iron being used for money outside of China in Europe. If we are going to use the monetary system to explain the empires, we should not omit China.